American DJ Freq Matrix Quad DJParts - All Variety of Parts that DJ Needs. 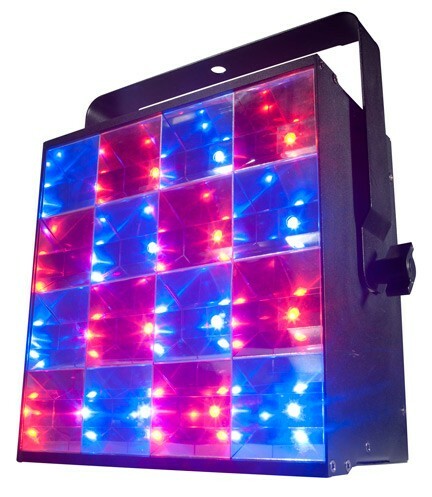 Add more creativity to your light show with ADJ’s FREQ MATRIX QUAD - a revolutionary 16-Zone RGBW LED Strobe Matrix. This 2-FX-IN-1 fixture features a traditional 4-IN-1 RGBW LED strobe + 16-Zone matrix chase effect. The matrix zone chase effect gives lighting designers the ability to create exciting and dynamic energy-driven lighting shows. Offers full DMX control with 4 DMX channel modes, dimming, strobe speed and chase speed. The FREQ MATRIX QUAD uses sixteen 8-Watt bright RGBW LEDs and consumes a maximum of 152-watts of power. Specifications: • 2-FX-IN-1: Traditional RGBW LED Strobe/Blinder + 16-Zone chase effect • 16x 8-Watt 4-in-1 RGBW LEDs (30,000 hr. rated) • 4-Button DMX LED Display • 3 Operational modes: DMX controller, Master/Slave & Sound Active • 4 DMX Channel modes (2, 5,18 or 64 Ch.) • 0-100% electronic dimming via DMX control • Includes exciting sound activate built-in matrix programs • LED pulse & strobe effect • Strobe up to1200 times per minute • Extremely Long Life (Rated at approximately 30,000 hrs) • Beam Angle: 120 degree • Runs extremely cool! - NO Duty Cycles! – Run all night! • Includes hanging bracket • Safety loop on rear panel • Very low power consumption - connect more units in a single circuit • IEC AC IN/OUT on rear to daisy chain power (up to 2 Freq Matrix Quad’s @ 120V and 4 Freq Matrix Quad’s @ 230V ) • Compatible with American DJ UC3 Series easy-to-use controllers (sold Separately) • Power Consumption: 152W maximum • Multi-voltage Operation: AC 100 - 240V, 50/60Hz • Dimensions (LxWxH): 12.5” x 6.5” x 13.25”/ 310 x 163 x 334mm • Weight: 15 lbs. / 6.6 kg.